Please note: If you're here for the Love Bugs Banners for Kids blog hop, please click here to be taken there. 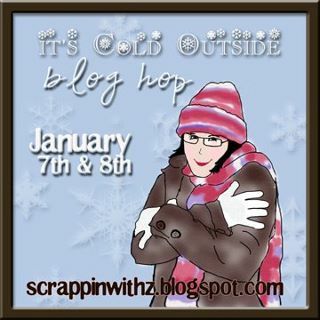 Thank you for joining us today on the "It's Cold Outside Blog Hop." If you arrived here from Lissa Marie's blog, or landed here by chance, welcome -- and please hop over to the start of the hop at Z's blog (http://scrappinwithz.blogspot.com/). Zenita will tell you about the blog candy available for followers on this wintry trail. I'm sure somewhere in what's supposed to be winter it's cold outside, but here in suburban Philadelphia, truth be told, it's unseasonably mild. The shine's shining and it's still nice enough outside to go without mittens and woolies. Yes, that's unusual for us. And yes, most of us consider ourselves blessed. I suppose there are some snowbunnies out there who might disagree ... but I detest snow. It may be fun to look at for a day or two especially if I have nowhere I need to go and can spend my time crafting. But after it's dingy and yellowed (ahem! ), sloppy and slushy, no thank you. 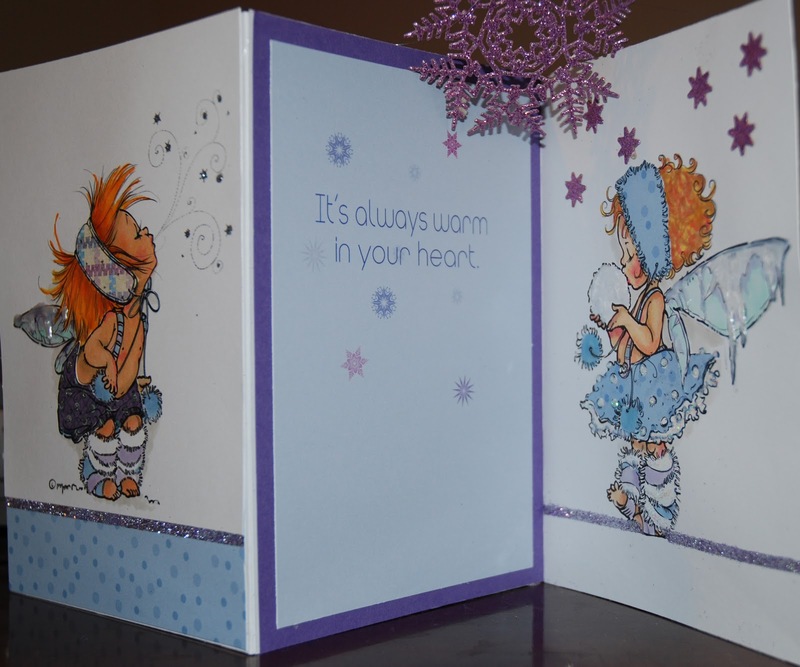 I made this three-paneled card to feature two of the cutest snow fairies I've ever seen. They are digi-images from Mo's Designs. I colored them with Copic markers, and paper pieced in complementing colors. Liquid Pearl gave the snow on the wings dimension and sparkle. Stickles lightly applied to snowflakes gave them a magical touch. The stripe of glitter is double sided 1/8" tape adhered to the paper then glittered with fine Martha Stewart glitter. I strung the beautiful snowflake between panels 1 and 3, using fishing line mounted underneath the art. The snowflake is cut from glitter paper using a Cheery Lynn die. The sentiment in the center is computer-generated with snowflake art by DaFont. Please jump on over to Anita's blog next to continue shooshing down the snow-covered path. I welcome your comments, and hope you'll come back often, for inspiration, a little story telling, and friendship. LOVE this card and your Copic coloring is AMAZING! TFS! I am a new follower and I would love it if you would check out my blog and do the same at ACreativeJourneywithMelissa. blogspot dot com. Have a great weekend! Love the tri-panel and the glitter is just enough! This "snowbunny wanna be" loves your card! As usual another great job!! Love your coloring on your fairies!!! Thank you for joining me on this hop! This is just gorgeous...I love your coloring! Thanks for sharing! Just adorable! Love your coloring! Thank you for being in this It's COLD outside blog hop with me. Hopefully, it won't be tooooo cold this winter -- already, it's been pleasantly mild in suburban Philadelphia! Hello from another Ellen. I can relate to your journaling on this blog. I am in California, where it is not cold. It was about 85 degrees on New Year's (but I was at the coast) and only a little colder this week. I scrap some of my winter photos with winter-themed products anyhow, so I'm doing the blog hop for inspiration. Love your card! BEAUTIFUL! AMAZING! Your snow fairies are gorgeous. Great three panel card. Love it. Thanks for sharing. Your card is sooooo pretty! Those images are just adorable! Thanks for sharing! I love this card and the you're right, these are the cutest fairies I have ever seen!!! Thanks for sharing and participating in the same hop! P.S. I'm "borrowing" and posting your button also! Unleash the beast, and Blog Candy winner! In Honor of Martin Luther King Jr.
Copic Blog Candy for a Monday! Love Bugs Banners for Kids Blog Hop - Day 2! Living on the Fringe ... in the Cold! !